The passing of Carrie Fisher has left her fans shocked and saddened, and many have joined forces to pay tribute to the star who played Princess Leia in the best way they know how, with lightsaber vigils. 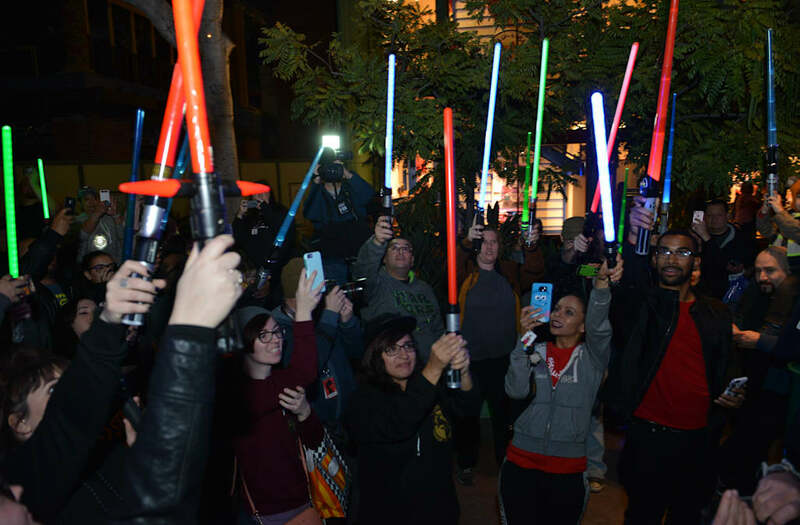 According to several news outlets, these events took place in at least two cities, with fans dressing up in their best "Star Wars" gear and bringing lightsabers instead of candles to honor the star. Hundreds of fans of actress and writer Carrie Fisher and her mother actress Debbie Reynolds hold lightsabers up in memory of actresses at Lightsaber Vigil in Disneyland Downtown in Anaheim, CA, United States on December 28, 2016. Fisher was well known for playing Princess Leia in the Star Wars film series and passed away on December 27, 2016 after a heart attack. Her mother actress Debbie Reynolds who also was an actress and singer played in dozens of movies including Singing in the Rain (1952) dies a day after her daughter on December 28, 2016. 'Star Wars' fan Elizabeth Boettcher, 12, holds her lightsaber during a candlelight vigil for actress Carrie Fisher at The Wings Over the Rockies Air and Space museum on December 28, 2016 in Denver, Colorado. The vigil, for Fisher, who portrayed Princess Leia in the famous movie, was held near the model of the Star Wars X-Wing fighter jet on display at the museum. Fisher died of an apparent heart attack on December 27th at the age of 60. Her mother Debbie Reynolds died today from an apparent stroke. 'Star Wars' fan Hazel Ramirez, 12, swings her light saber around outside of the Wings Over the Rockies museum on December 28, 2016 in Denver, Colorado. A candlelight/light saber vigil was held for 'Star War' actress Carrie Fisher who died of an apparent heart attack on December 27th at the age of 60. Fisher portrayed Princess Leia in the famous movie. Her mother Debbie Reynolds died today from an apparent stroke. 'Star Wars' fans Anne Hatzakis, in middle, with her daughter Mira, 6, hold lightsabers during a candlelight/lightsaber vigil for actress Carrie Fisher at the The Wings Over the Rockies Air and Space museum on December 28, 2016 in Denver, Colorado. The vigil, for Fisher, who portrayed Princess Leia in the famous movie, was held in front of the model of the Star Wars X-Wing Starfighter jet on display at the museum. Fisher died of an apparent heart attack on December 27th at the age of 60. Her mother Debbie Reynolds died today from an apparent stroke. 'Star Wars' fans of all ages hold up candles and lightsabers during a vigil for actress Carrie Fisher at the The Wings Over the Rockies Air and Space museum on December 28, 2016 in Denver, Colorado. The vigil, for Fisher, who portrayed Princess Leia in the famous movie, was held in front of the model of the Star Wars X-Wing Starfighter jet on display at the museum. Fisher died of an apparent heart attack on December 27th at the age of 60. Her mother Debbie Reynolds died today from an apparent stroke. 'Star Wars' fan Reyna Palmer, 10, middle, and her mother Tonia, second from right, and other fans hold up candles and lightsabers during a vigil for actress Carrie Fisher at the The Wings Over the Rockies Air and Space museum on December 28, 2016 in Denver, Colorado. The vigil, for Fisher, who portrayed Princess Leia in the famous movie, was held in front of the model of the Star Wars X-Wing Starfighter jet on display at the museum. Fisher died of an apparent heart attack on December 27th at the age of 60. Her mother Debbie Reynolds died today from an apparent stroke. Austin held an event at the Alamo Drafthouse Theater with a huge crowd raising their lightsabers in the air for their beloved princess. They estimate more than 200 people attended the event. Downtown Disney, which is part of the Disneyland Resort in Anaheim California, had another large gathering after an event was posted on Facebook. Fans lifted their lights in the air as well, paying tribute to the star by illuminating images and wishing the force be with her. Many people in attendance were also honoring Fisher's mother, Debbie Reynolds. Reynolds died a day after her daughter. The actress and singer played in dozens of movies including Singing in the Rain. Debbie Reynolds was 84-years-old. Circa 1956, American actor and singer Debbie Reynolds smiles and holds her infant daughter, Carrie Fisher. A newcomer to the ranks of fatherhood, Eddie Fisher was named 'Father of the Year in TV' by the National Father's Day Committee. Mrs. Fisher (Debbie Reynolds) and the children presented Fisher with a handsome photo wallet containing their pictures. Carrie Frances is 19 months and son Todd (L) is 4 months old. Actress Debbie Reynolds, still deeply upset over separation from singer Eddie Fisher, was hospitalized here suffering exhaust indigestion. Meanwhile MGM Studios plan to shoot 'around' the actress until here where she is working in The Mating Game. Debbie holds her two children, Carrie and Todd, 8-mos, (right) in this photo made during the current shooting at the site. Debbie Reynolds with her daughter Carrie Fisher, 23 months old, smiles as she leaves the house September 9, 1958 to visit friends in Los Angeles, California. Husband Eddie Fisher and Miss Reynolds later revealed their separation. Carrie Fisher, 3, gives her mother Debbie Reynolds a hug after her afternoon nap in their home November 16, 1959 in West Los Angeles, California. (Photo by Ray Graham/Los Angeles Times via Getty Images) . Debbie Reynolds and Eddie Fisher with daughter Carrie Frances born October 21, 1956. American actress Debbie Reynolds with her daughter Carrie Fisher. Debbie Reynolds and Carrie Fisher during 11th Annual American Comedy Awards at The Shrine Auditorium in Los Angeles, California, United States. Debbie Reynolds with her children Carrie and Todd Fisher, on the site of the new museum that will house her collection of film costumes. Actresses Debbie Reynolds (L) and Carrie Fisher (R) arrive at the premiere of 'Star Wars Episode III: Revenge of the Sith,' at the Loews Cineplex Uptown Theatre May 12, 2005 in Washington, DC. Star Wars premiers are taking place across the country tonight. Actress Carrie Fisher (L) and her mother, actress Debbie Reynolds, arrive for Dame Elizabeth Taylor's 75th birthday party at the Ritz-Carlton, Lake Las Vegas on February 27, 2007 in Henderson, Nevada. Actress Debbie Reynolds (R) unveils the site of the new Hollywood Motion Picture Collection which will house her $30 million collection of movie costumes and props in Hollywood, June 19, 2001, with daughter Carrie Fisher at her side. The movie memorabilia museum, set to open February 2002, will be located at the Hollywood & Highland development which is also the site of the Kodak Theatre, permanent home of the Academy Awards ceremony. Actresses Debbie Reynolds and Carrie Fisher arrive at the premiere of HBO's documentary 'Wishful Drinking' at Linwood Dunn Theater at the Pickford Center for Motion Study on December 7, 2010 in Hollywood, California. Carrie Fisher (L), Debbie Reynolds, and Billie Lourd attend Paley Center & TCM present Debbie Reynolds' Hollywood memorabilia exhibit reception at The Paley Center for Media on June 7, 2011 in Beverly Hills, California. Actress Debbie Reynolds (L) and her daughter Carrie Fisher (R) arrive at the 2011 Primetime Creative Arts Emmy Awards in Los Angeles September 10, 2011. Actors Debbie Reynolds and Carrie Fisher arrive at the 2011 Primetime Creative Arts Emmy Awards held at the Nokia Theater L.A. Live. Actresses Debbie Reynolds, Carrie Fisher and Joely Fisher arrive at the premiere of HBO's documentary 'Wishful Drinking' at Linwood Dunn Theater at the Pickford Center for Motion Study on December 7, 2010 in Hollywood, California. Carrie Fisher and Debbie Reynolds attend the all-star gala and press preview of Profiles in History's Debbie Reynolds-The Auction Finale at Debbie Reynolds's Dance Studio on May 14, 2014 in North Hollywood, California. Actresses Debbie Reynolds (L), recipient of the Screen Actors Guild Life Achievement Award, and Carrie Fisher pose in the press room at the 21st Annual Screen Actors Guild Awards at The Shrine Auditorium on January 25, 2015 in Los Angeles, California. Actress Carrie Fisher (L) and actress Debbie Reynolds attend TNT's 21st Annual Screen Actors Guild Awards at The Shrine Auditorium on January 25, 2015 in Los Angeles, California.